After about a 45 minute drive several of us noticed a building blur by. Oops, our driver missed a turn and drove right by the church. If you are able to follow stories of other members of our team, you may hear about some of the traveling adventures. I’ve lived and traveled in many wild places, so I didn’t really notice anything too harrowing or unusual during our in country travel. That said, I want to say, we had excellent drivers the entire time we traveled around El Salvador! Our driver smoothly performed a u-turn on a narrow two lane highway and took us back to toward the church. We turned off the highway and came to a stop at the next turn. There were a lot of people and a smiling man in a red shirt standing on either side of the road we were to turn onto. I was clueless for just a moment and then I realized, the people of the Eternal Rock of Singuil Church were lining the shorter road to the church. Even now as I write this, the memories are rolling and so sweet, and I’m feeling the experience all over again. Who am I that God would choose me for this opportunity, and then allow me to experience such a welcome? Each of us walked down the road, with smiling people on either side, children, mamas, dads and grandparents. 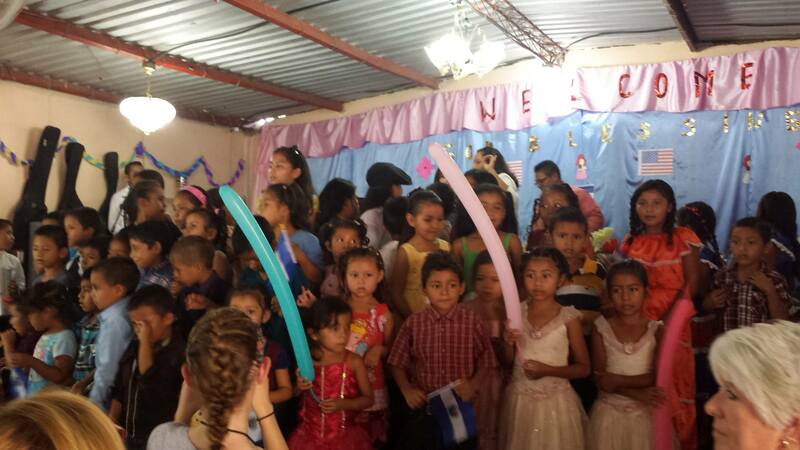 Some of the children waved flags, El Salvadoran and of the United States. As one of the ladies on the team said, it seemed like a celebrity welcome. We are just ordinary women, from all over the United States and Haiti, saying a simple yes to our God, to be the hands and feet of Jesus. To listen, to see, to love and to pray, that is why we were there. And as I write those words I think I understand why they were all there, welcoming us in. Jesus. He is our common connection. As I neared the end of the line, just before the doors to the church building, a beautiful little girl named Andrea handed me a pretty foam doll puppet and took me by the hand. She led me all the way to the front pew, and most of the way to the right. Andrea sat with me, taking the puppet from me, and giving it back to me again. Then she would look at my face and make eye contact, and take the puppet away again. This went on for just a few minutes, then she jumped up and joined the children who had gathered at the front of the church. She is delightful and made me laugh! Candy, the pastor’s wife, began speaking to the children, then they began to sing. They sang, in English, Open the Eyes of My Heart. For several months I’ve been praying the words of this song. I’ve been praying for God to show me what the yearning is inside of me, I’ve been praying that He would close the distance between Him and me, and let me know Him, love Him, rightly. And there I was in Caserio Singuil, with Spanish speaking children singing the song for us. 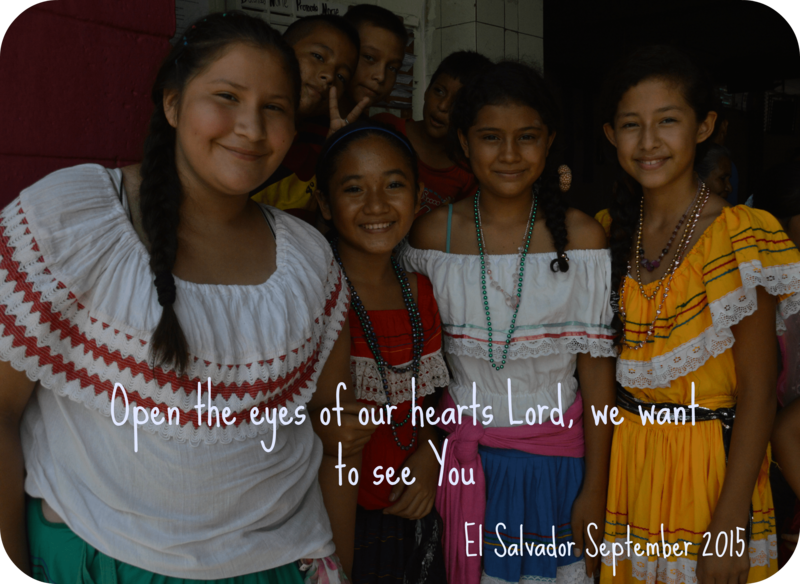 Yes, Lord, Open the Eyes of My Heart. He was there, in the midst of poverty and need and spiritual distance, drawing each of us closer to Himself. After this song the children sang another, and here is where the sponsor visit side of the day got started. In this lovely crowd of children singing a funny Noah’s Ark song, several children were prompted to make animal sounds or to sing a short solo. There were timid meows and funny oinks and lovely voices, but then there was one voice, strong and sweet. And the precious little singer turned to look right at the woman sitting next to me, her sponsor! What a beautiful moment it was when they each knew. When the song was over Jenifer slipped right up to Pat. It was a very special moment! This is one of the moments where I saw with my eyes how very important sponsors are to these kids. 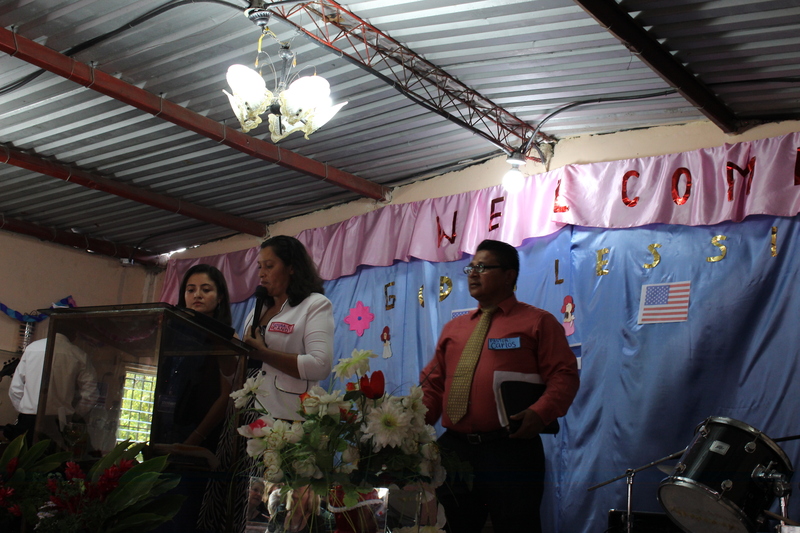 Pastor Carlos preached an encouraging message that set the Scriptural tone for the rest of the week. At each place we visited after Sunday, the message God began speaking to me was built upon by each of the other pastors. One of the other woman on the team, Terri, has written about the Pastor’s message. I’m going to let her tell you all about it. 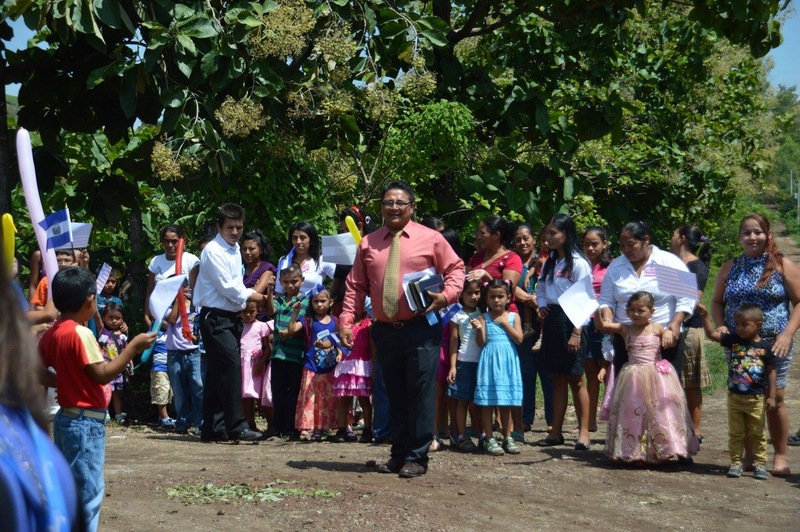 After the service it was time for the other sponsors of the children of Casa del Pan to meet the kids! 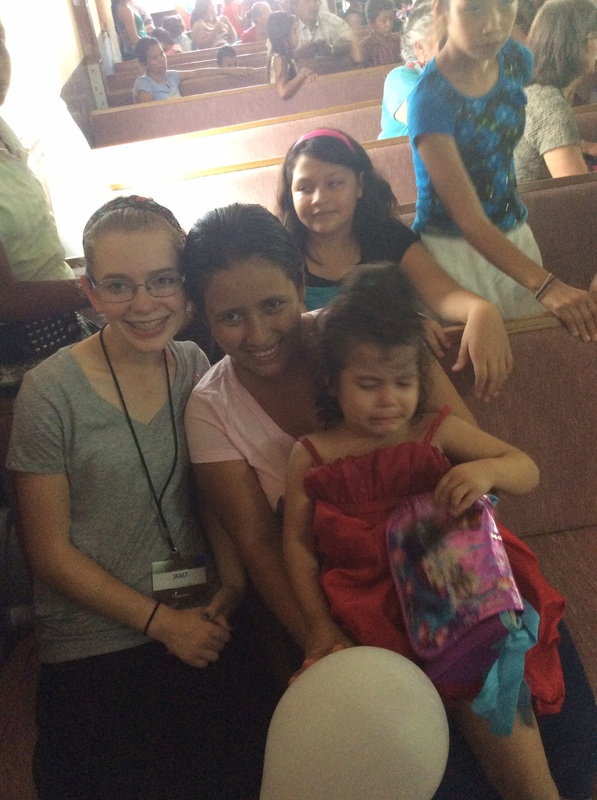 My daughter, Janet, met her little sponsored girl, 4 year old Allison. Poor Allison, she was hot and tired and not interested at all in the American teenager with the gentle smile and a bag full of fun things. Allison’s mom was summoned and she sat down next to Janet. With David translating, Janet and Allison’s mom conversed and prayed and smiled for pictures. I am so proud of my girl. At 14 she showed so much maturity and understanding during a time that I was wondering if she would shrink or feel bad. Her compassion for Allison and understanding of her discomfort was full of grace and a joy to witness. All of a sudden the sponsor meetings and gift giving was over and it was time to change for the home visits. For sweet Allison, I think it meant she’d get to go home, eat some lunch and take a nap. I hope so. 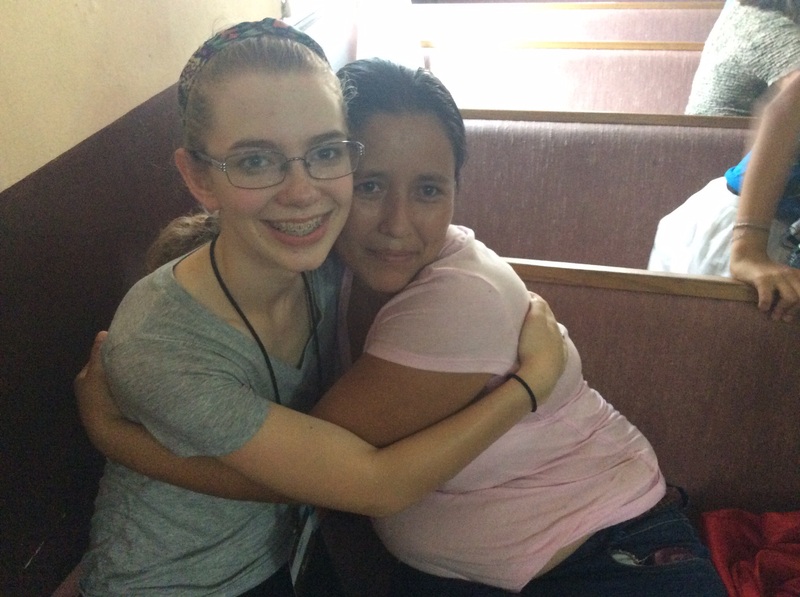 We are looking forward to a future trip back to El Salvador, and the opportunity for Janet to visit with Allison when she is a little older and has an a better idea that this stranger is her friend. At the end of our time at Casa del Pan, we gathered everyone together, Compassion El Salvador staff, Casa del Pan Staff and our team of women. It was time to pray and then be on our way. Our team was committed to praying over each center and the people involved in keeping the programs running well. Pastor Carlos and Candy turned the tables on us after we prayed, and began praying for us. 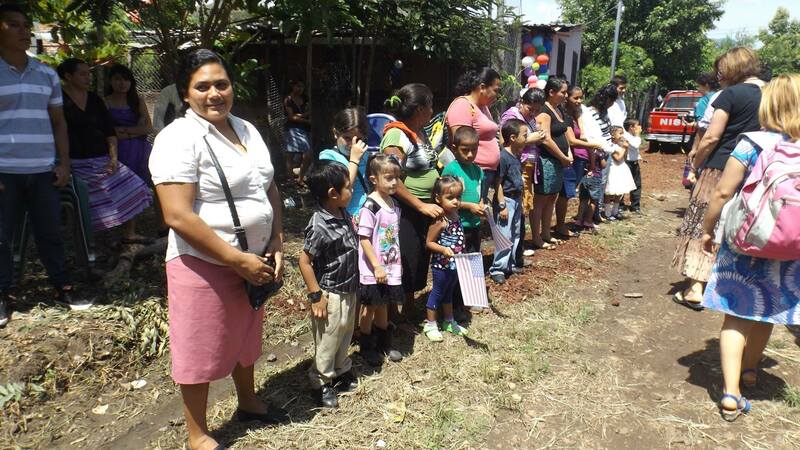 As Candy prayed fervently, she laid hands one each of the women in our team who sponsor children at Casa del Pan. My Spanish is very rusty, but I could understand much of what she prayed, she prayed for health and strength, for financial provision, but above all she prayed for each of them to know God and love God and that He would keep each one them close to Himself. Clara of War Room has nothing on Candy. Candy is a real person, and she prays like she means it. 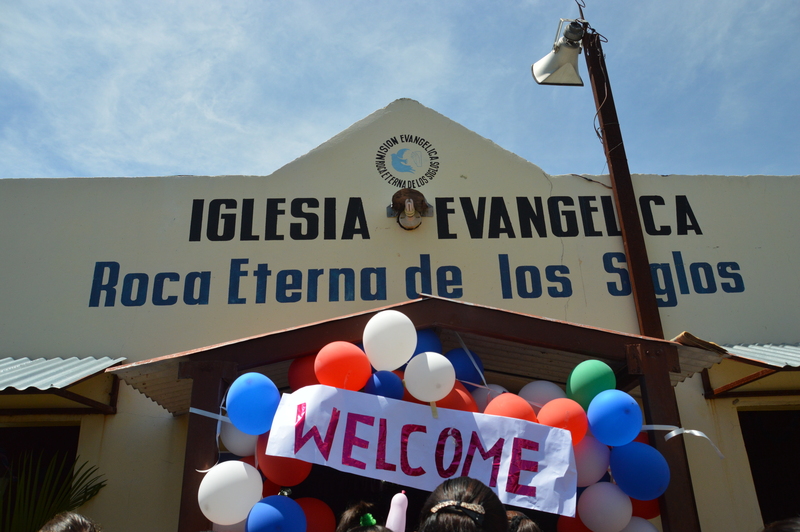 In telling you about this time of prayer, I only want you to be inspired and to know that the work of the Lord Jesus is vibrant in El Salvador. People are coming to know Him, follow Him and be changed by Him. God is using Compassion International to come along national pastors and local churches, to strengthen them in the work they are already doing. And it is working. During the day at Casa del Pan we went on a home visit and had lunch with a family. I will share about that experience in the next post. Michelle this is beautiful and just as I remember it with all the extra things like you and Janet meeting your child Allison and her mother, .Jenifer looking at Pat and then slipping up to her …wow! I did not get to see that, your words brought tears to my eyes when you wrote of it how wonderful! From us passing the project and the u-turn LOL I had forgotten the u-turn to Candy’s powerful prayer I can see it all once again. What a great day thank you for taking me back! So glad to be able to remember pieces of that day with you Terri! What a neat opportunity to worship with this church! And how sweet of Janet to connect with Alison’s mom…my toddlers are usually ready for food and naps and won’t talk to others after church either. I know that when Allison is bigger, she and Janet will be able to connect…how fun will that be! ?